My kids like eating broccoli stir fry with any meats,for example beef or fish fillet. They used to called broccoli as “little trees” when they were small. Not only do they like the flavour of broccoli, but also love the shape of this beautiful vegetable. What a satisfactory feeling I have when seeing my own kids eat some greens. 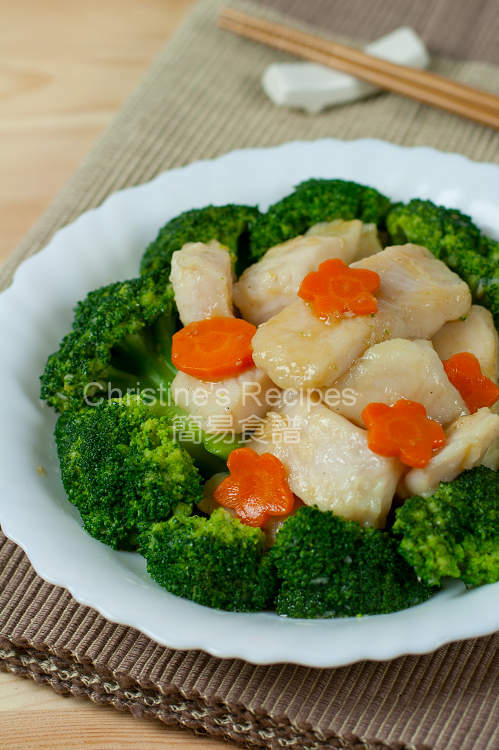 The broccoli absorbs all the goodies and flavours of fish and sauce. They often ask why there are not enough “little trees” on the plate. 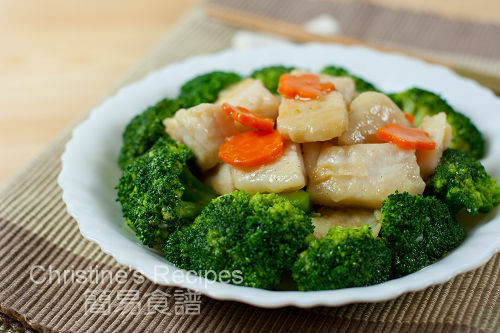 This dish, Stir-fried Broccoli with Fish Fillet goes really well with steamed Jasmine rice. Rinse broccoli and drain well. Peel off the hard skin from stem. Cut into smaller pieces. Add 1/2 teaspoon of salt in boiling water. Blanch broccoli in boiling water for 3 minutes. Remove broccoli from boiling water with a slotted spoon and immediately wash in cold water to stop cooking and keep its fresh green colour. Drain well. Mix the fish with marinade well and leave for 20 minutes. Heat oil in a pan fry pan or wok. Place the fish on one single layer. Cook over medium heat for about 2 minutes each side, until both sides turn opaque white. Don’t over cook the fish. Set aside, covered. Add some oil in wok. Saute the garlic, add broccoli and carrot. Increase heat to high. Pour wine into the vegetables, and quickly stir. Sprinkle salt to taste. Add chicken stock and cook until sauce reduced to half. Toss back the fish. Lightly stir and combine, avoid breaking the fish into pieces. Add thickening and cook to your preferred consistency. Serve hot. This is my husband favourite. It's very pretty! The way yo assembled the dish. I know how tactful you are with the stir-fry. You keep the fish fillets all in such good shapes : ). not just my family member, its my favorite too, thank you for sharing!!! and i move to Melbourne now, hope you can share all interesting things around oz with me !! Coz still dunno where can buy stuffssssss at a cheap cheap price!! !miss those cheap products in HK,,,heheeee! Hi Christine - if I grew up having this vegetable dishes looking this good I am sure I would have eaten much more! I like this dish. Very simple and home cook. Love the presentation of a dish like this; makes it way more delicious! Very healthy and simple. What a lovely presentation! Takes me back to my childhood; my dad would cook a similar dish often with fresh fish, sometimes using fresh bean sprouts. What type of fish do you use? Fresh bean sprouts are very good as well. Love that little veggies. For this dish, sometimes I used perch or cod, this time I used basa fillet. Hi Christine. I just wanted to let you know that the Thickening Sauce is missing 2 tbsp of water. I made it earlier tonight and thought the sauce was really thick and wasn't really enough to coat the fish and broccoli. I didn't think to check the Chinese recipe but I noticed the discrepancy. Thanks so much for letting me know. The chinese version has got 2 tbsp of water in making the thickening, somehow I missed it out by mistake when translated the recipe. I made this the other day...it was great!! I made this the other day and it was so delicious!! I paired the dish with one of your fried rice recipes and my friends and family thought I bought it take-away from a local dragon boat restaurant! My dad cannot eat broccoli, so I replaced it with bokchoy and it was still so delicious. This recipe is no doubt my favourite! Thank you so much for sharing! Wonderful ! So glad that your family loved this dish. So clever to tweak it to suit your dad's taste. Bokchoy is a very good choice. Thank Christine Ho. I love this recipe. Thanks Christine! This is a great recipe. The first time I made it I brought it to a potluck, and it was the first dish to go! I have made it so many times since - it is so yummy and nutritious.